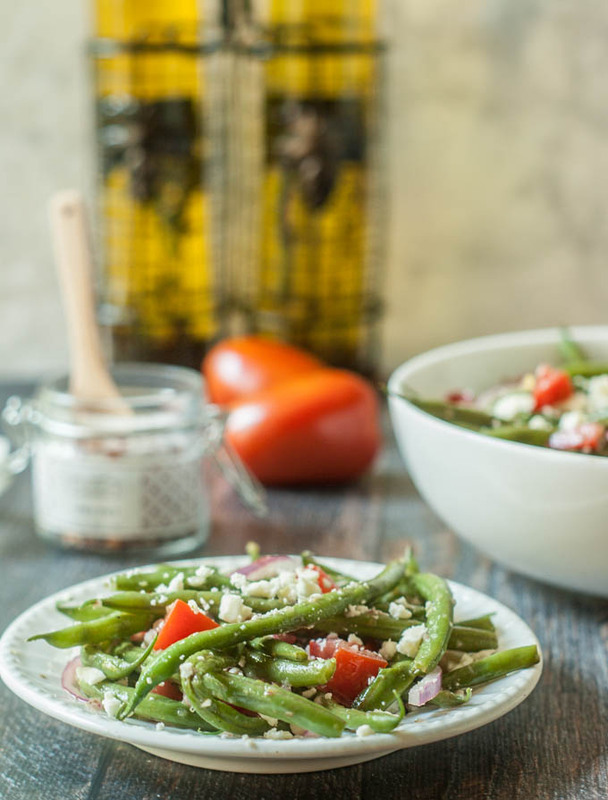 This Greek green bean salad is the perfect summer salad. Using vegetables from your garden or farmer’s market, you can make this delicious vegetarian salad in 15 minutes. So we did another Costco run last week and I bought green beans. 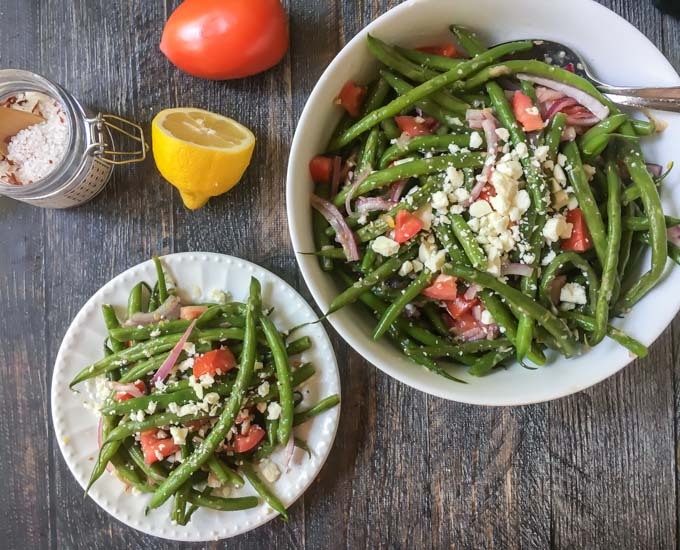 We had Asian green beans and green beans & bacon but I didn’t think my family could take a third day of green beans so I made this recipe for myself. 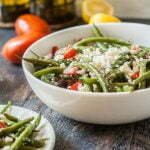 I had some pretty roma tomatoes and lots of feta cheese so I decided to make this Greek green bean salad. The salad dressing is what really makes it. It has shallots and garlic and lots of lemon. 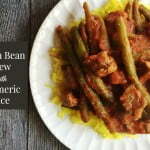 Believe it or not my husband loved it, even though it was his 3rd day of green bean dishes. I have a lot of Greek flavored recipes on this site. 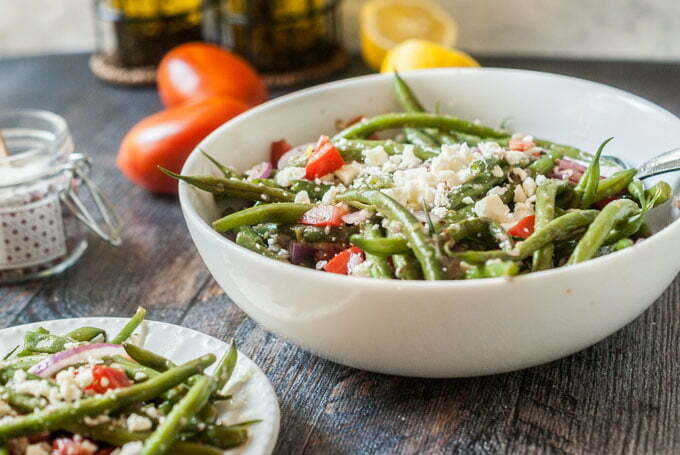 I have a Greek sweet potato salad , Greek stuffed peppers and a Greek zucchini salad so this green bean dish is similar to those dishes, but I like what I like. This dish is simple but very tasty! 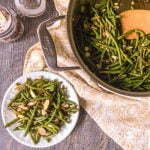 It would be perfect for a summer picnic or just a side dish using vegetables from your garden. Just a few notes, I microwaved the beans for 5 minutes first. I didn’t want them completely raw but I didn’t want the limp either. I use this to steam all my veggies in the microwave and love it. And for the red onions, they should be sliced as thin as you can. That’s all for my notes. 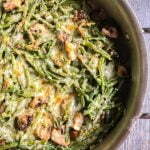 So when summer comes and you are looking at mounds of fresh green beans, think of this recipe. You won’t be sorry I promise! 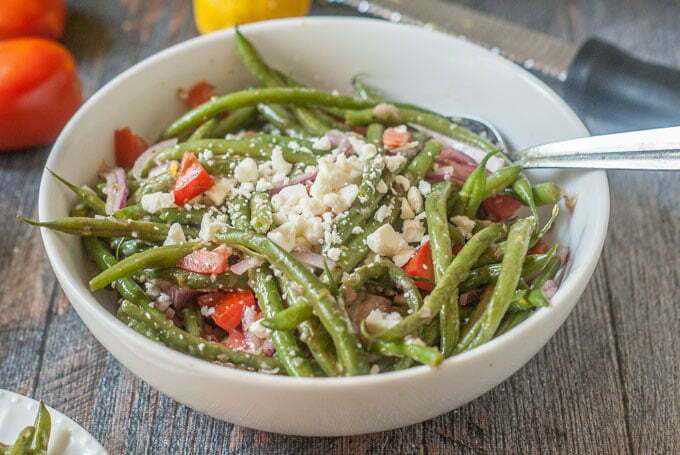 This Greek green bean salad is the perfect summer salad. Using vegetables from your garden or farmer's market, you can make this delicious vegetarian salad in minutes. Microwave beans for 5 minutes. Take them out and let cool. In the meantime add the shallot, garlic, vinegar, olive oil, oregano, salt, pepper, lemon juice and lemon zest to a food processor and blend on high for a few seconds. Add the beans, onions and tomatoes to a large bowl and mix with the dressing. Top with the feta cheese and refrigerate until ready to eat. Holds up well the next day too! Previous Post: « Low Carb Cilantro Lime Shrimp Cocktail – with avocado dipping sauce.